For I have sinned I stole the December Vogue out of my college library, I figured not many people would read it. 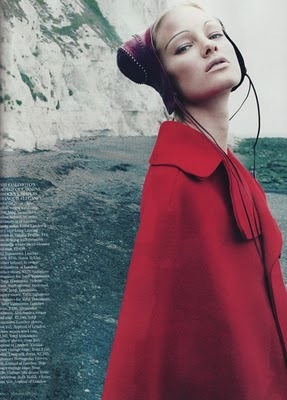 But anyway I found this editorial in it. 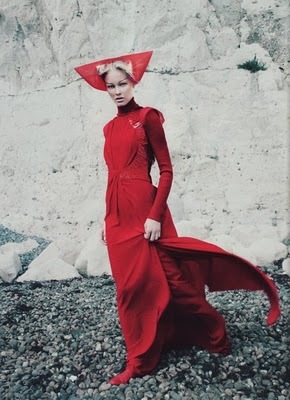 It really reminds me of Margaret Atwood's The Handmaid's Tale I had to do it for my A2 English Literature coursework, my folder is covered in these images. If any of you have read the book I hope you understand where I'm coming from. 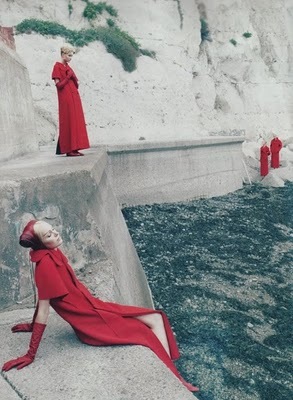 The book is about a woman (Offred) who is a Handmaid and her uniform is exactly like would be, its terrifying as the novel is set in a dystopian society where women belong to men and have to wear red nun like uniforms as they are used as breeders, the reason why they wear red and wings is to alert people of their presence but also hide them, as the population is dying. Although I personally think the story is a love story,it is horrifying.